During the American Revolutionary War, the Congress decided that the country needed a flag to represent the united colonies. On June 14, 1777 the Second Continental Congress passed a Flag Resolution. This day is still celebrated as Flag Day in the United States. The resolution said that the United States Flag would have 13 red and white alternating stripes and that there would be a blue area with 13 white stars. They didn't give an exact description of the flag and there were several different versions. Did Betsy Ross sew the first flag? Legend has it that seamstress Betsy Ross sewed the first American Flag from a sketch that George Washington gave her. No one is sure if this story is fact or just a myth, but it makes for a good story. January 13, 1794 - The number of stars and stripes was each changed to 15. 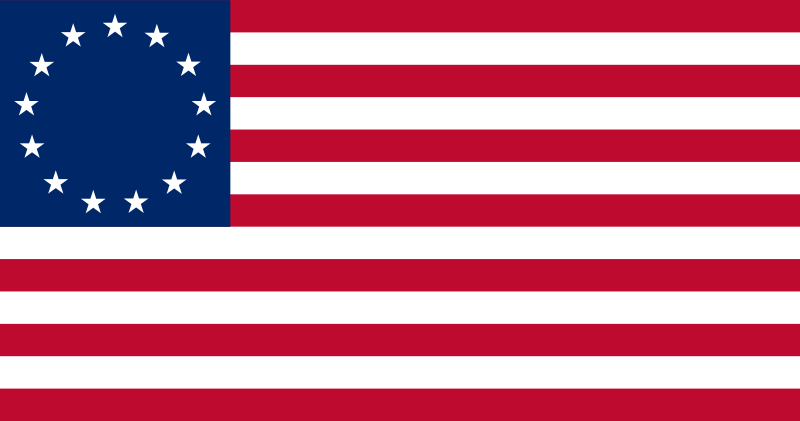 April 4, 1818 - Changed the number of stripes back to 13 and allowed for one star for each state. June 24, 1912 - Officially gave the proportions of the flag as well as the arrangement of the stars. The stars would be in six horizontal rows of eight each with a single point of each star to be pointing upward. January 3, 1959 - Changed the star pattern to seven rows of seven stars each, staggered horizontally and vertically. August 21, 1959 - Changed the star pattern again to nine rows of stars staggered horizontally and eleven rows of stars staggered vertically. Flag waving in the wind. The official flag is to be 1.9 times as long as it's width. It has thirteen red and white alternating stripes with a red stripe on the top and on the bottom. The blue part in the upper left is called the Union. The Union is to be 7 stripes tall. There are 50 white stars in the Union representing the 50 states. They are in 11 staggered horizontal rows of 5 and 6 stars. What are the names of the flag? The US flag has several nicknames. The most popular ones include the Star Spangled Banner, the Stars and Stripes, and Old Glory. Flags surround the Washington Monument. This is a nickname for the United States flag. The original Star Spangled Banner flew over Fort McHenry during the Battle of Baltimore which was part of the War of 1812. Francis Scott Key wrote a poem about the battle and flag that was later turned into a song. The song eventually became the National Anthem of the United States. The United States flag is a symbol of our freedom. Many men and women have died over the years to preserve our freedom and the flag represents them as well. There are rules of flag etiquette some of which include never letting the flag touch the ground, how and where it should be displayed, and that it should be lit up if flown at night.